Isometric Training and Muscle Fibre Types is the focus of this article, following from the introduction in Isometric Exercise Hold Times. If you haven't read that article yet, do so now, as a lot of what follows won't make much sense. In the previous article I explained that there is a great deal of confusion about different isometric hold times. There is simply no one size fits all hold time. Nor should there be! Strength of Contractile Force: The amount of force in your contraction. Eg. Maximal tension being 100 % of your effort, 60% effort being just under the point at which the muscle shakes. Time Under Tension: How long you hold that contraction for. Both of these factors determine the overall intensity of the contraction. And these 2 factors are adjusted based on the SPECIFIC GOAL you have set be it weight loss, muscle building, strength development etc. Do you know Your Fibre Types? But we'll look at the basics of Isometric Training and Muscle Fibre Types now. 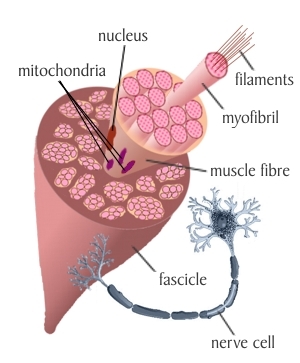 - Intermediate Fibres (FIG) are fibres that can become either Slow or Fast depending on the stimulus. An this group be subdivided further. If you do more endurance based activity e.g. marathon's they'll mostly become SO. If you spend your time lifting heavy weights explosively they'll mostly become Fast Twitch. These can take between 2-7 days to recover. - Fast Twitch (FG), again there are more subsets to this but basically there's easy access Fast twitch and hard to access fast twitch. These are generally ticker fibres than SO. They are fast to activate, capable of generating huge muscle tension and strength, but last only seconds and can take a minimum of 7 days to several weeks to recover. Now depending on your goal you would want to stimulate and target the specific muscle fibres. If you want endurance - stimulate SO fibres. If you want muscle mass and strength then stimulate the FG fibres. Those that spend their time doing repetitive movements e.g. multiple weight lifting reps and sets or distance and endurance based activity primarily stimulate the development of SO fibres. This takes a long time and is best done using submaximal isometrics. Because it's sub-maximal tension you can of course train more frequently - but in doing so you will develop thinner tissue. A moderate intensity isometric program 3 times a week will hit some of the FIG fibres, but not many. Again, same problems as before. The strong, thick fibres that create muscular strength, the FG fibres are only stimulated under the greatest muscular straining (highest intensity), when the SO and FIG fibres have fatigued - isometrics present the fastest safest way to stimulate these fibres. This is why I advocate over a weeks rest between sessions in my programs. It simply takes that long to recover. But this is just another piece of the overall puzzle. In the next issue I'll examine the role of varying Isometric Training and Muscle Fibre Types stimulation to create massive calorie depletion for weight loss and for stimulating the central nervous system to enhance your hormonal health for increasing your immune system and radically accelerating muscle growth! You've been reading about Isometric Training and Muscle Fibre Types. Check out a load of FREE Isometric Exercises you can try RIGHT NOW - here.